Wealthfront is a robo-advisor company that takes a software-only approach. No financial advisors. No chasing the market. Just software-driven passive investing. The startup was founded to democratize the finance industry, making it easy for anyone to invest wisely. They provide “context for all”—jargon-free clarity on all things finance. They have more than $8 billion in assets under management, which means they’re closing in on the leading independent robo-advisor, Betterment ($10B). People Google their name close to 60,000 times a month, and they get about 88,000 monthly visits to their website from organic search. They’re well-funded, too. Wealthfront already raised $130 million, and they’re raising another $75 million as of January 2018. And they’re planning to further invest in content. At the time of publishing this teardown, they’re hiring a head of content marketing. We examined Wealthfront’s content to see what we could learn from this fast-growing fintech startup. We also made some predictions about how their content game will mature down the road. Where does Wealthfront’s content live? 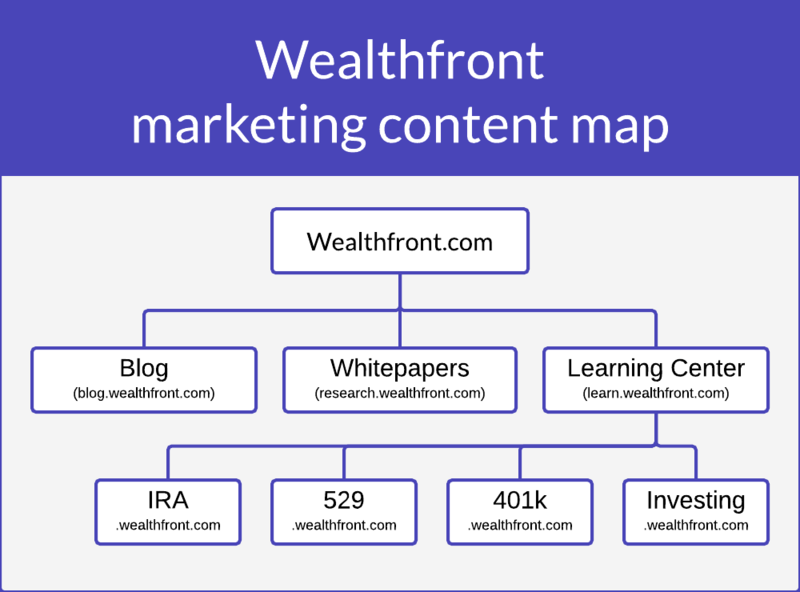 Before we explore how Wealthfront uses content, let’s get a high-level view of what (and where) their content is. 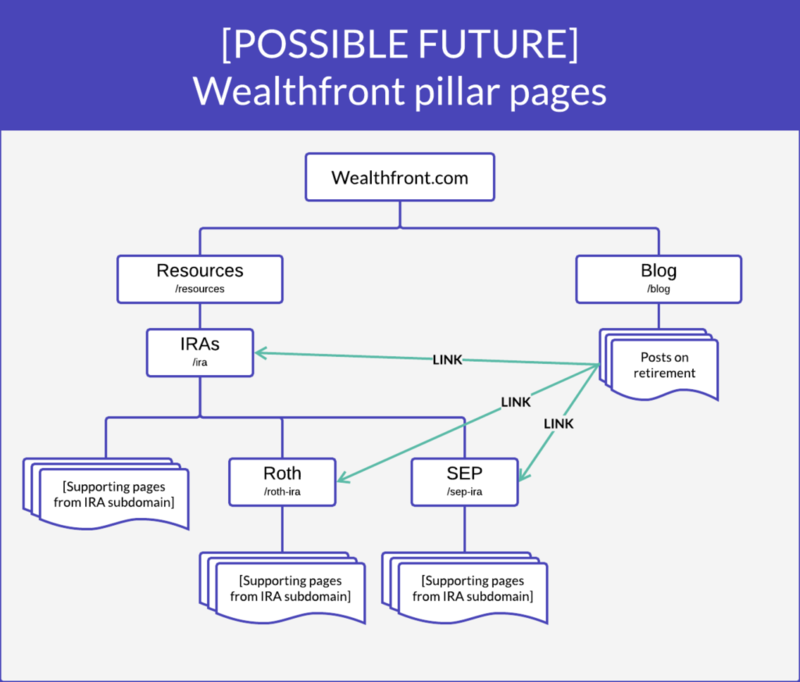 The Wealthfront content ecosystem lives primarily on Wealthfront.com and a series of subdomains. Wealthfront.com: This is where people learn about and use Wealthfront. 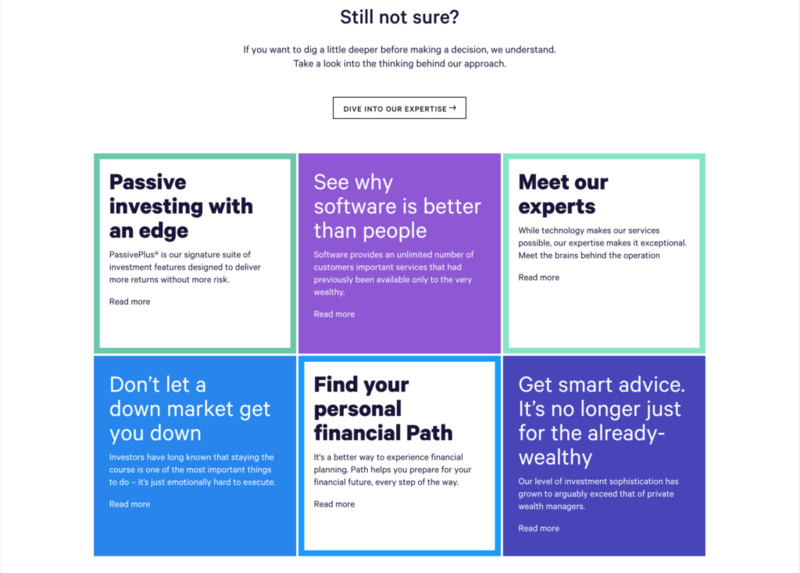 The site includes pages that describe Wealthfront’s product and solutions, as well as their mission and ideology. This is where new users set up their accounts and where current users log in. 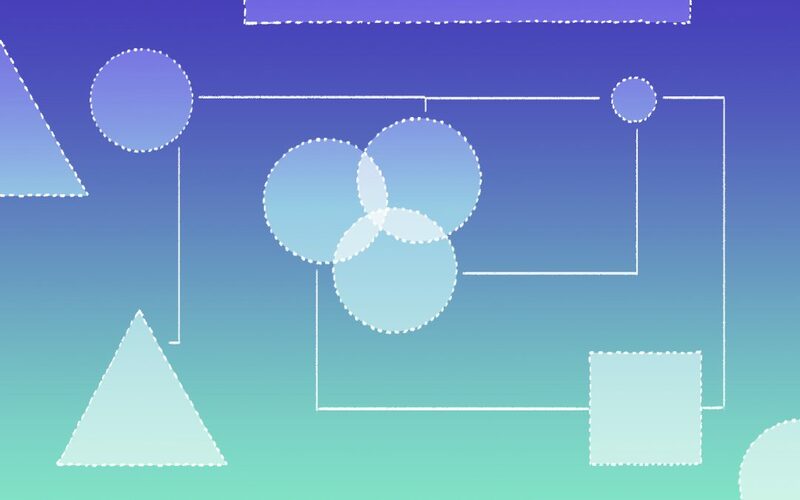 Blog.Wealthfront.com: Here you’ll find articles covering investment, taxes, retirement, career advice, and company news. Wealthfront also maintains some social presence: their Facebook page has about 57,000 likes, they have about 32,000 Twitter followers, and their YouTube channel has more than 1,100 subscribers. 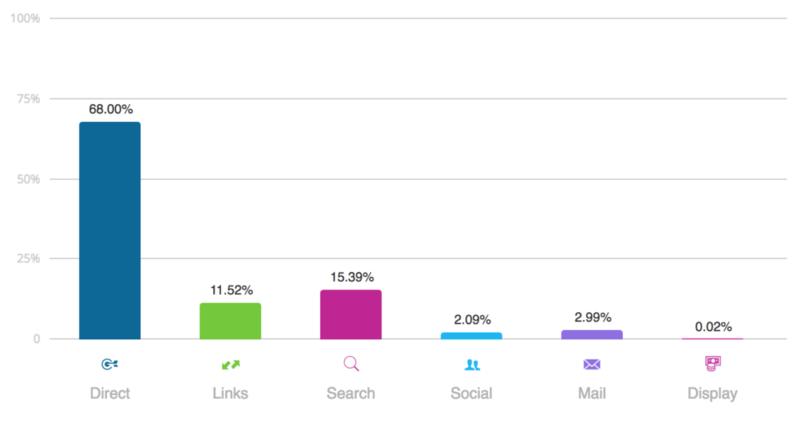 Where does Wealthfront get its traffic? 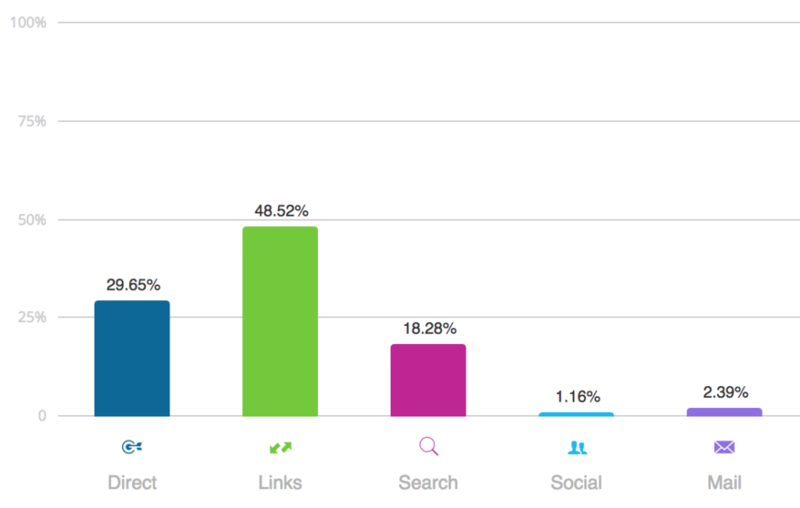 The majority of Wealthfront’s traffic comes from two sources: direct and search. Direct traffic involves someone navigating straight to Wealthfront.com (without Googling it first). They either type “wealthfront.com” into their browser or use a bookmark. These people are existing Wealthfront users, word-of-mouthers kicking the tires, competitors snooping, and people like me who are doing their homework. Search traffic can refer to organic search (e.g., people Googling “ira vs 401k” and finding this page). It also covers traffic from SEM ad spend. According to Similarweb, about two-thirds of the traffic to Wealthfront’s main site is direct. This isn’t a huge surprise. People who want to check their Wealthfront accounts know where they need to go. 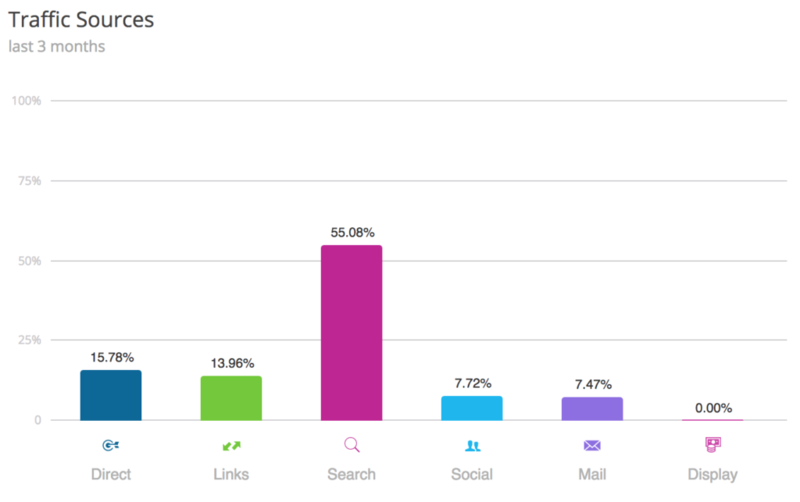 What about that 15% from search traffic? We’ll get to that in the next section. No surprises here. 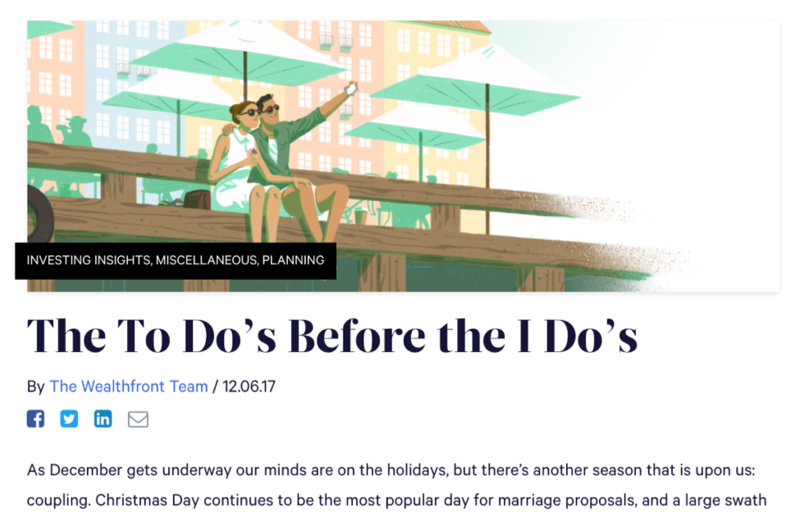 Wealthfront produces good content, much of which is in-depth and written with the kinds of titles that are sure to get clicked if they show up in Google search results (like Your 2017 Year-End Personal Finance Checklist). Of course, the Learning Center subdomains get traffic from other subdomains on Wealthfront.com, too. Now let’s take a look at how all this organic traffic makes its way to the Wealthfront main site and blog. We know that Wealthfront’s main site and blog are pulling in the majority of their traffic from search engines. About two-thirds of Wealthfront’s total search traffic is branded—that is, people Googling “Wealthfront,” “Wealth Front,” or even the 800 people who Google “Welathfront” every month. Branded traffic is good. It’s a sign that usage and awareness are on the rise. Wealthfront has put a lot of effort into developing their brand, so it’s good to see it paying off for them. Beyond this, brand awareness is vital for Wealthfront as it competes for mindshare with other robo-advisor brands, especially Betterment. This means most of Wealthfront’s organic traffic is hitting high-level pages on their website. According to Ahrefs, their homepage alone accounts for 49% of their organic traffic. According to Ahrefs, the blog accounts for more than a quarter of Wealthfront’s organic Web traffic to all of their properties. Think Carefully Before Signing Up For a High Deductible Health Plan’s featured snippet ranks #1 for “hsa vs ppo,” which gets about 2,600 Google searches a month. *Numbers in the “%” column represent the estimated percentage of the site’s overall organic traffic a specific page generates. Wealthfront could pretty handsomely increase their organic traffic by taking advantage of a few key opportunities—more on that later. The robo-advisor does seem to spend a little cash on paid search ads. 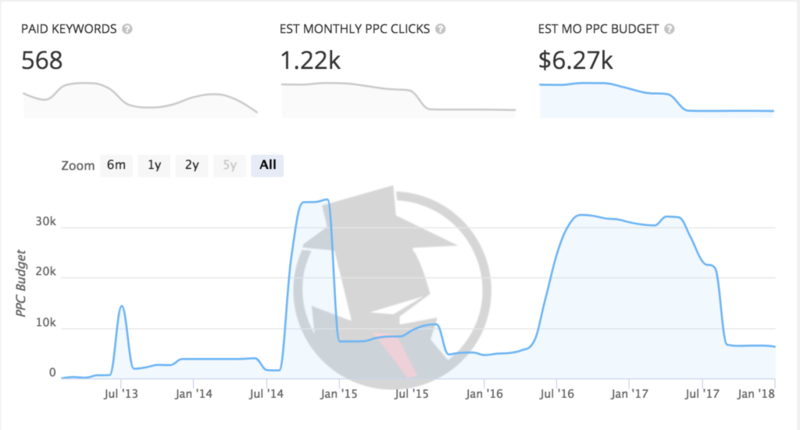 Spyfu estimates their monthly ad spend at a little over $6,000. That’s peanuts compared to Betterment’s estimated $91,000 monthly spend. AdWords is a helpful tool for challenger brands who want to capture high-intent search traffic—especially while their organic rankings are still on the rise. We saw in our Casper marketing teardown that the mattress company invests heavily in AdWords (and uber-specific landing pages). Once Wealthfront hires a head of content strategy, I assume we’ll see a lot more Wealthfront ads showing up in Google search results. In order for Wealthfront’s software-only approach to take hold, they need to establish a trustworthy brand that resonates with their audience’s aspirations. If you look at how often Wealthfront’s content is shared on social media, it seems like they’re on a good path. The average Wealthfront page gets shared about 430 times on social media. That’s ahead of Betterment’s average of 360 shares per page. So what’s getting all those shares? The most shares go to articles about new product offerings and updates, explanations of company stances, and funding. If you have an awesome product in active development, your fans will gobble up news about it. Some other popular articles include their list of career-launching companies, their breakdown of the financial advisor hierarchy, and several of their offerings pages. Now that we know how people are finding their way to Wealthfront and what they’re sharing, let’s look at the blog content itself. Wealthfront credited nine individual contributors to their blog in the last year. About 60 percent of their blog posts were written by Andy Rachleff, Wealthfront’s co-founder, president and CEO. The longest post on the Wealthfront blog in the last year was about 3,430 words long. The shortest post was almost a tenth that length: just 360 words. Currently Wealthfront averages about 1,300 words per post. The Wealthfront blog hovers between the 11th and 13th grade reading levels (that’s excluding the disclaimers). Not bad for a brand discussing retirement accounts and cryptocurrency. If that’s where they’re heading, then we expect the reading level to go down as their content strategy takes shape. The Wealthfront blog is a thing of beauty. Custom art in the headers, a single-column layout, no interruptive popovers. A friendly email capture peeks out at you when you’ve reached the bottom of the page—but that’s as pesky as it gets. 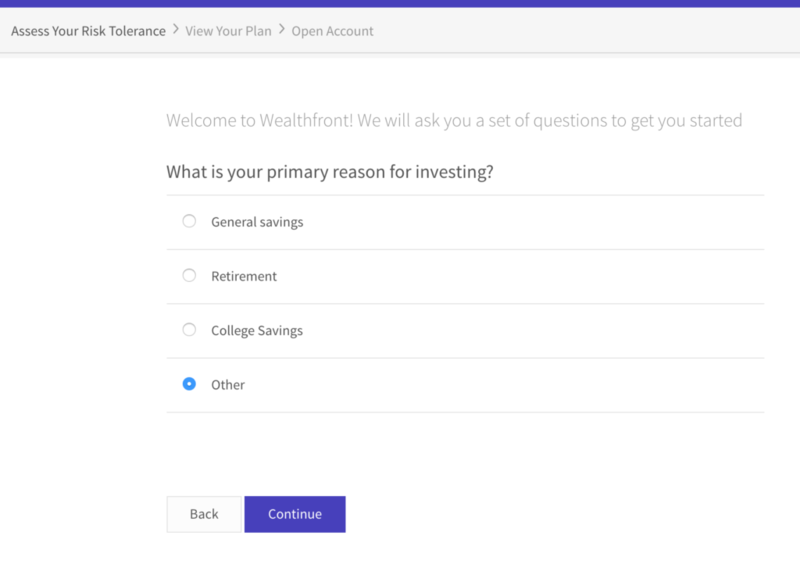 At the end of each blog post, Wealthfront invites the reader to open an account. If the reader chooses to open an account, Wealthfront walks them through a quiz-like assessment of their financial situation and goals. This is good: it means that every time Wealthfront CEO Rachleff writes a new blog post, he doesn’t need to think about what the reader will do next. A default next step exists: open an account. Wealthfront is giving every piece of content a job (just like HubSpot and Casper). Predictions: what will Wealthfront do next? Tech startups often face a challenge when it comes to blogging: where’s that blog going to live? Putting the blog on a separate domain is a bad SEO move: you end up trying to build up two domains instead of one. On the other hand, blogging on the main domain (which is usually where the Web app lives) can make non-marketers nervous. You don’t want a blogger to accidentally take down the whole site. Blogging on a subdomain is a common compromise. About half of B2C fintech startups are doing it this way. Search engines might recognize that your subdomain content should be associated with your main site. But there’s no guarantee (see Rand Fiskin’s talk on this). In the case of Wealthfront, seven subdomains is way overdoing it. (Hopefully) moving the blog to a subfolder on Wealthfront.com. Search engines are getting smarter. Google is thinking in terms of concepts, not just keywords. Which means that sites who organize their content around a few strategic, topic-specific pages are enjoying some increased search traffic. They grouped keywords into overarching topics. They linked the related blog posts to that page, and had that page link back to those related posts, creating a “cluster” of different posts around that topic. The result: as of January 2018, they’re enjoying a 107% increase in traffic to their lead-gen pages. Wealthfront should (and probably will) do this, too. They’ll eventually develop pillar pages for Roth and SEP IRAs, too. Wealthfront will identify other high-level topics that it wants to generate traffic around and treat them similarly. Right now Wealthfront doesn’t appear to be putting much effort into growing an email list. (They’re not even gating their whitepapers!) But that’s probably going to change. The job description for their head of content marketing mentions building funnels, which means we can probably expect to see more offering-specific resources that give people value in exchange for contact information. We may also see more career-development freebies—webinars and guides to help young people make (and invest) more money by advancing their career. 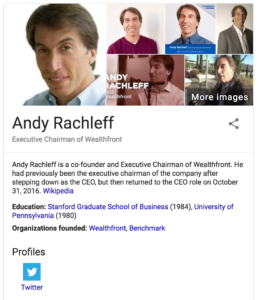 Wealthfront’s main author on the blog is their co-founder and CEO Andy Rachleff. He’s notable enough to get a Knowledge Panel beside Google’s search results for his name. His words carry a lot of weight in the startup innovation world. Which means when he speaks for Wealthfront, people listen. People are more likely to share, and link to content that comes from someone they already see as an authority. You don’t need a celebrity on staff in order to run a good content marketing game. But if there’s anyone of note on your team, make sure they’re contributing to your content. What if the big guns are too busy to write? If you can’t get an ebook, get an outline. Your marketing team should be able to turn that outline into a full piece. Then your in-house guru can put on the finishing touches (including their name). This principle is important enough for Moz to include it in their 2018 SEO checklist. Don’t leave it out of your strategy. There’s a host of generic personal finance information online. Wealthfront’s content isn’t part of that. The Wealthfront brand is built around a few investment principles. They choose to focus on managing risk, lowering taxes, and minimizing fees. When you read their blog articles, you can see that all the major decisions they make stem from their brand philosophy. But it also highlights a major difference between Wealthfront and Betterment. (The latter uses a blend of software and advisors). It’s refreshing to see a blog that’s not packed with interruptive calls to action telling you to download a free ebook, sign up for a webinar, or start a free trial. A lot of companies choke when it comes to content marketing. They have a hard time allowing a piece of content to be valuable enough on its own to build trust for the brand and (maybe) draw people further in. Their blog posts are good, and they know it. Wealthfront’s a growing brand. Most of their traffic goes straight to their homepage. And a lot of those visits are from people who are just now learning about Wealthfront. Maybe their friend mentioned it to them. Maybe they clicked on a link in a finance-related article somewhere. Maybe they saw that Wealthfront made CB Insights’ Fintech 250. New visitors are strangers, and Wealthfront can’t assume that every stranger will be ready to open an account on their first visit. So Wealthfront provides visitors with opportunities to read various content pieces. When you hit the Wealthfront homepage, you get the product pitch. But if you’re not ready to create an account, you’re invited to explore. 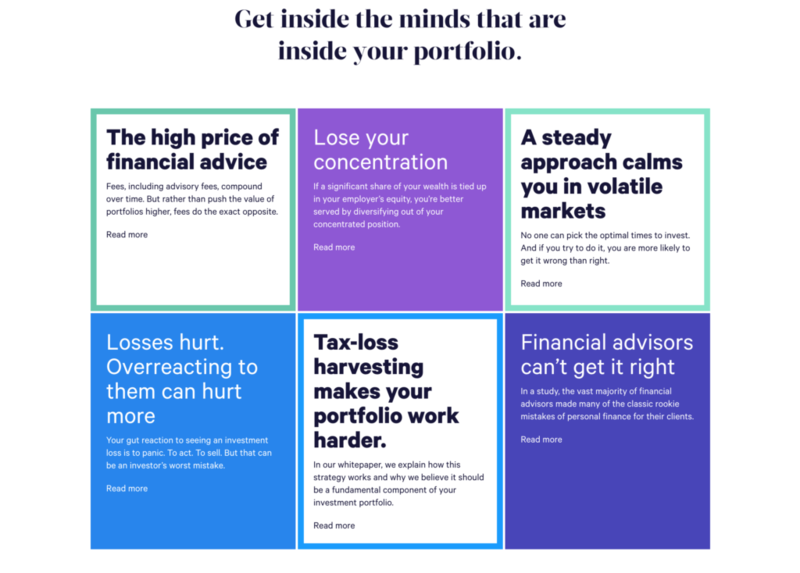 Wealthfront serves up a mix of product and content pages—all of which give visitors ways to see how Wealthfront can help them achieve their life aspirations. You see this happening on Weathfront’s expertise page, too. First they promote the philosophy behind the software. Then they promote the (highly educated) people behind the philosophy. Then they invite you to read thoughts from those people. If you want to grow your content marketing channels, watch how the fast-growing companies are doing it. There’s a lot to learn from where Wealthfront is and where they’re headed. If you want to talk about it sometime, shoot me an email.